So, you want to work from home. Maybe you want to be available for your kids, or maybe you are tired of the 9-5 rat race. I’ve been working from home for the past 7 years and let me tell you, it can be HARD. I’ve had to deal with people who think my “little business” is some type of a scam. I didn’t have a good support system at home – at times he sabotaged it. My son was only a few months old when I first started working from home. 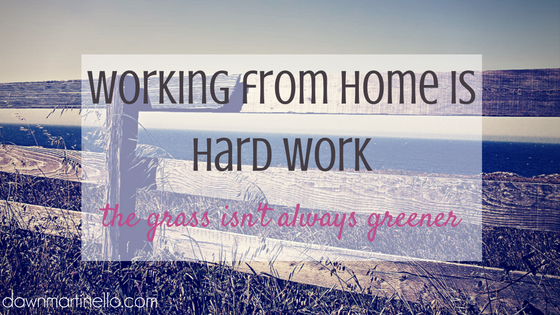 Working from home can be a godsend, but there are a few challenges that people don’t always talk about. The best part about working from home is also the worst part .. you’re working from home. Alone. Working a regular job affords you the luxury of talking shop with people who get what you’re talking about. Have you ever tried to talk strategy with a 7 year old? You can go days without any kind of face-to-face human contact if you’re single, so getting out is so much more important. Plan a lunch with some friends, become more involved in your kids school, go to chamber of commerce events, work a day or two a week in a group office setting. My little man can melt my heart when he wraps his arms around me and tells me that he wants me to play with him instead of work. When I surprised him with a 1 week mommy-and-me trip to Cuba, he just about peed his pants … because it was an entire week of my devoted attention to him. Here’s the thing – guilt is going to happen. Just roll with it. Know that you and your kiddo will get through it and be just fine when you get to the other side. Plan your work schedule around what happens in your family. I quit work just after 3pm until after my son goes to bed at 7:30. It’s not always ideal for business, but it is what I need to do to make things work. This one is always the thorn in my side. I don’t want to be working day in and day out, 7 days a week. Everyone has a finite amount of time to spend working each day, and as a single mom, mine seemed to be shaved a little closer than most. We’re conditioned to think that we’re superheroes and have to do it all on our own. Not so. At some point, something will need to give, so it’s better to prepare for it now rather than having things crash around you later. Hire a VA: A lot of people think that they have to have made it big (or bigger) to justify hiring a virtual assistant. If cost is a concern, look for a more general VA and have them do some of the smaller tasks like setting up meetings, handling email correspondence, or publishing your blog posts. Create a solid schedule: It’s crunch time and you need to make the most of it. You may need to wake up early, or perhaps put in an hour or two after the kids hit the hay. If it works for you, separate your day into the various tasks that need to be done: client work from 9am – 11am; lunch and self care from 11am – 12pm; client work from 12pm – 3pm; business building from 3pm – 4pm. I also use my Google calendar to keep track of everything. One calendar is strictly for business, one is for personal. It makes it easy to see exactly what needs to be done each day. Interruptions: There’s not a whole lot you can do about these but be sure to set up boundaries. You will run into people who think that because you’re home, even if you’re working, that you’re available for guests to drop in, leave to do whatever, or hop on the phone. Stay strong, be firm, and keep your head on. My sister-in-law asked me one day – what kind of at-home business do you think I can start? Whoa .. that’s a loaded question. There’s a lot that goes into creating any kind of business, and now that you know some of the more miserable parts of working from home, getting it right is kinda important. You need to be really specific here. Being home for the kids or making money isn’t going to cut it on the days where you’re ripping your hair out and give a solid consideration to packing it in and going back to a regular job. When I first started out – long before I opened the doors to my original virtual assistant business – I wanted to add to our household finances. My then-husband had a tendency to make me feel extremely small and not worth a whole heck of a lot even when I was working outside of the house so it was incredibly important that I still made a solid contribution financially. Being home for my son became more of a necessity after I ended my marriage because there was no one else available if he were to get sick or during his days off from school. Grabbing an idea from the sky isn’t really a great idea and I don’t think you need me to tell you that. Take a look at your past experience, your passions, what do people tell you that you do exceptionally well? Those are the things you’ll need to look at when coming up with an idea for a business. Keep reading to the bottom of the post – I’ve got some great at-home businesses that can get you heading in the right direction. Some businesses can be started quite inexpensively (I started my business when we were in the red and had about $20 in the bank) but you still have to be realistic when it comes to money. You’ll need to think about things such as buying a domain name, marketing (business cards, website, etc), and licensing. 7 years later and this is something I still struggle with. You can’t burn the candle at both ends so set a quitting time each day. During the day, take at least one 15 minute break. Step away from the work and grab a book, a nap, or go for a walk. Some of my favourite ideas are below – The Mogul Mom has a few more ideas for you here and there’s 5 more ideas on Simple Mom. No brainer, right? I’ve written about this before and you can get started with my Business Plan eKit too. Promise me that you won’t choose blogging just because you can’t think of anything else to do and you figure that everyone will love reading what you write. Check out David Risley or Pat Flynn’s site. Whether you have your own product or you’re doing something dropshipping, there are a lot of ways you can create your own store. Sandi Krakowski’s 12 week store could be exactly what you need to get into if this is something new to you. If you can type at a decent speed, you can market yourself as a transcriptionist. Your start up is next to nothing and I can guarantee that this is the one job that no business owner wants to do on their own.